Middle school student Nina-Simone Brown had the chance to experience Newton’s third law of motion in an exciting yet unusual way Monday morning. For those who dozed off in their middle school science class: For every action there is an opposite and equal reaction. And there was plenty of action when FMA Live! 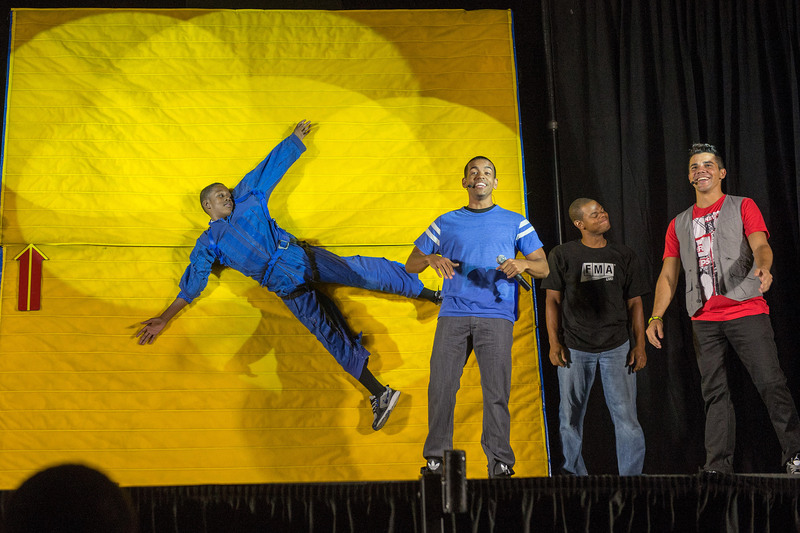 Forces in Motion swept into Hardy Middle School’s gym Monday, bringing Newton’s three laws of motion and the law of universal gravity to life in a performance with hip-hop music and moves, bright lights and live science demonstrations. Short videos featured Sir Isaac Newton (1643-1727) channeling his explanation of the laws through an actor. Nina-Simone, 13, and her partner faced off against two other Hardy eighth graders in a dunk-tank contest – Hardy Assistant Principal Loren Brody sat underneath a tank of applesauce. The students used giant slingshots to aim blue and red balls – called apples – at a target to release the tank of applesauce onto Brody. 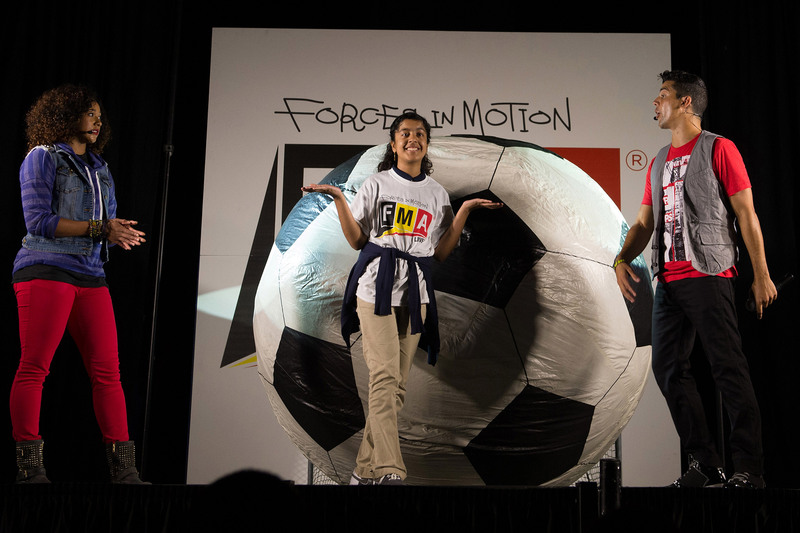 The FMA in the program’s title stands for force = mass X acceleration. The program is a partnership between Honeywell Hometown Solutions, the charitable arm to Honeywell, the technology invention and manufacturing company, and NASA. The program is part of NASA and Honeywell’s strategy to encourage more students to think about careers in STEM – science, technology, engineering and math. Leland Melvin, NASA’s associate administrator for education and a former astronaut and pro football player, said to get students motivated about science and math education, you first have to catch their attention and get them interested. Melvin made two trips to the International Space Station, in 2008 and 2009. He majored in chemistry and later earned a master’s degree in materials science engineering. He said part of his job is to merge private industries, government agencies and the education system to focus on interesting students in math and science and to help them succeed in college. Patricia Pride, Hardy principal, said students have been in class for about three weeks and have begun learning about lab work and the scientific method. Honeywell Hometown Solutions President Tom Buckmaster said with 70 percent of American students below target proficiency levels for science and math, it’s become vital to get children interested and excited about the subjects. “We thought about what it would take to enliven the classroom, create a more dynamic conversation, empower teachers, create excitement among students, and we landed on a concept of an old-fashioned traveling road show that was updated to be hip-hop and powerful and high energy,” Buckmaster said. Pride, who taught science for 11 years, said programs and action shows like FMA Live! help students see the relevance of the science they’re learning with real-life application. “It gives some excitement, it gives some energy to what some students unfortunately would think of as ‘Oh, my gosh. I’ve got to go to science class,’ and it really puts things – like it says – in motion,” she said. The show at Hardy was the first of a planned 30-show tour. The next stop is Philadelphia. For more information about FMA Live!, visit: www.fmalive.com. Authored by Jessica Wray, this article appeared first at www.SHFWire.com. Jessica Wray is a senior at Franklin College in her hometown of Franklin, Ind. She studies journalism with a focus in news writing and public relations. Wray is a former executive editor of Franklin College’s student newspaper, The Franklin, and was a co-host and producer of a weekly news program for the campus radio station, WFCI 98.5 FM.